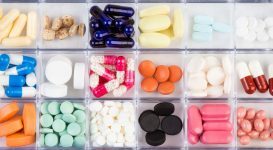 Which Medications Are Used as Abortives? Naprosyn (Naproxen, Anaprox, Anaprox DS). Ergot alkaloids are strong medications that constrict blood vessels, something that OTC drugs do not do. The most commonly prescribed ergots are Cafergot (ergotamine tartrate) and D.H.E. 45 injection or Migranal nasal spray (dihydroergotamine mesylate). 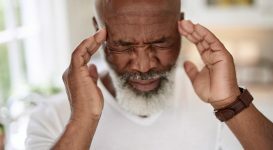 Other types of medications used to abort a migraine include Midrin, which is a combination of isometheptene mucate (a vasoconstrictor), dichloralphenazone (a sedative), and the analgesic acetaminophen. Antihistamines are also commonly used to ease migraine symptoms. 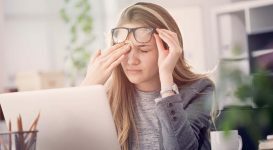 Histamine, a substance that dilates blood vessels and causes inflammation in the body (a similar response caused by a migraine), is counteracted with the use of an antihistamine. Antihistamines are grouped into sedating and non-sedating types. Diphenhydramine (Benadryl) is a sedating antihistamine while loratadine (Claritin) is non-sedating. As with any drug, both preventative and abortive migraine medications come with a list of side effects and precautions. It is important to go over these with your physician to make sure there are no adverse interactions with other prescription medications you are taking and the side effects are worth taking the drug. CGRP inhibitors: pain, redness or swelling at the injection site, and constipation. Triptans: tingling, flushing, sleepiness, and throat and chest tightening. Combining triptans with selective serotonin reuptake inhibitors (SSRIs) and selective norepinephrine reuptake inhibitors (SNRIs) could cause an overload of serotonin in the body. This is known as serotonin syndrome and is life-threatening. Symptoms include a rapid increase of blood pressure, fast heart rate, and increased body temperature. Ergot alkaloids: nausea. They should not be used with drugs that inhibit a certain liver enzyme. Combining these drugs could result in a life-threatening decrease in blood flow to the extremities and/or brain. Beta-blockers: fatigue, depression, nausea, insomnia, dizziness, and low blood pressure. Calcium channel blockers: weight gain, constipation, dizziness, and low blood pressure. Tricyclic antidepressants: weight gain, dry mouth, sedation, decreased libido. Anti-seizure medications: side effects depend on the type of drug you are taking, but often include dizziness, drowsiness, weight changes, and fatigue. Antiseizure medication topiramate, can cause decreased sweating and increased body temperature, it is important to wear light clothes and drink plenty of water, especially during warmer months. If body temperature rises, contact your physician immediately. 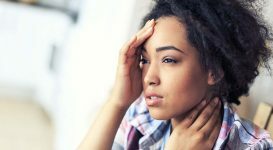 You might also like...Could Cognitive Behavioral Therapy Help Migraine Sufferers? Are These Safe to Take During Pregnancy or Breastfeeding? Migraines may become less frequent during pregnancy, but in the case that they do not, non-drug therapies should be tried first. These are considered first-line options during pregnancy and include relaxation, massage, sleep, ice packs, and lifestyle changes. If those fail and drug treatment is required, acetaminophen is the first treatment of choice. NSAIDs are considered to be the safest second-line options during the second trimester. Opioids are third-line options. Use of these types of medications could lead to abuse, addiction, and dependence in mother and child. When the mother fails to respond to any of these treatment options, triptans, typically sumatriptan, is used. Ergotamines should not be used during pregnancy; they may induce hypertonic uterine contractions and vasospasms/vasoconstrictions, which could cause harm to the unborn baby. Women who have chronic migraines and are pregnant may benefit from taking preventative medications. 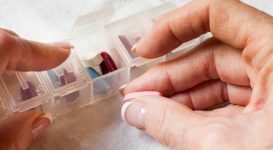 Beta-blockers, the calcium channel blocker verapamil, and low dose SSRIs, SNRIs, and TCAs are generally considered safe options. Generally, the same medications used during pregnancy are safe to use after delivery and while breastfeeding.